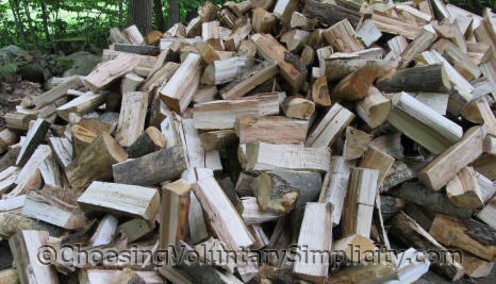 Our plan to order another truckload of logs came to a screeching halt the morning I called to place the order and arrange for a delivery date. There had been, the receptionist told me, some changes in load size, pricing, and availability since our previous order. Not only had the number of logs in each truckload been reduced… the price had been increased… making the price per cord almost double what we had paid before. And the final kicker… it had been such a wet spring, she said, they were having trouble getting the heavy machinery into the woods, and she wanted me to be aware that they probably would not have logs for sale again until another year. Finding another source of firewood turned out to be extremely difficult because we are not willing to buy from individuals or companies who are involved in clear cutting. 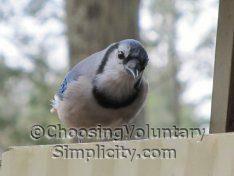 We’ve watched as several old properties in our area have been sold, the previously beautiful wooded areas clear cut, and every living thing for acre after acre destroyed. It hurts to even look at what those horribly destructive machines have done. So we’re not about to encourage clear cutting by purchasing firewood from someone involved in this type of logging. Unfortunately, we soon discovered that almost all of the logs and firewood for sale in this area were originally harvested by one of these clear cutting operations. It was looking like we might be in for a long, cold winter! And then… finally… one of my phone calls reached a man who hates the clear cutting as much as we do. He takes pride in doing only selective cutting and doing it right… leaving the forest in better condition than when he and his helper come in to cut. He told me he prices by the load… not by the cord… and that each truckload of firewood would be a generous one. He delivered an evaluation load first (this, he said, was his policy with a new customer), and then he delivered seven more. These photographs are of the first three loads, cut, split, and ready to be stacked. In the end, standing up for what we believed really paid off. We got some really great firewood… and more than we had expected. After the wood was all stacked, we discovered that each “cord” load this man had delivered was almost a cord and a half! Good for you! I hope you spread the word as much as you can — probably a lot of people don’t even think about the provenance of the wood they buy. The best thing you can do to slow the clear-cutting is help other people understand why they shouldn’t support it. After all, if everyone keeps buying from clear-cutters they will never change their practices. Good for you for sticking up for what you believe in. That isn’t easy especially when it feels like everyone else is taking the easy way. I’m glad it all worked out. Happy stacking! I live in the Bahamas and two large dead trees felled themselves in the yard this week. 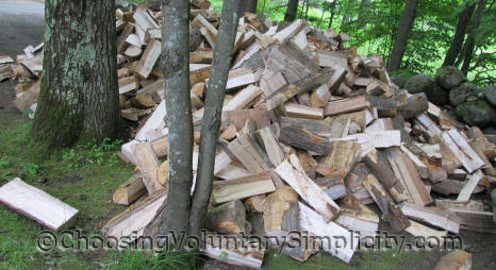 We have to just chop it up and toss it as it does not really get cold here at all and there is no need for massive amounts of firewood here. I wanted to make raised beds and some outdoor stool stumps out of them but they are devastated by termites. I am confident that enough trees fall down on their own that makes clear cutting completely unnecessary but of course, some people want the profit without care for the consequences. Sadly they are clear cutting all the mountaintops in West Virginia and now doing blast mining….I don’t get it. I’m not sure about where you live, but around me there’s a big business in tree pruning and felling for safety reasons. My husband is an arborist as a “side job” and cuts down a small number of trees for homeowners that want more sun or are worried about collateral damage in the next hurricane. He often sells the wood at a reasonable price, especially if you don’t want it cut to length and split! You may find an arborist or tree service near you that would welcome the chance to get rid of some wood without having to split it first. I hate the idea of clear cutting! we are lucky enough to have 1 acre of mostly woods that we live on.The trees are black locust,maples and a few evergreens.The black locust are old and each year several fall down(aka wind/winter damage).If I can we leave them as they fall, the woods looks beautiful this way.It serves some benefit to animals/birds and leaves the woods undisturbed.It is NOT a popular thought to many neighbors and I have had many difficult situations due to their constant(yearly) pressure to clean this up and manicure the land.Not while I am breathing lol My opinion is to let nature do what it does best and use what we need from the land as it provides for us not take take take.This land and it’s inhabitants were entrusted to me 30 plus years ago I am not about to bend to pressure.I am lucky enough to have a tree guy who is an arborist to help guide me.So happy you can be warm and buy from someone who has values. We buy our firewood too, most of it anyway. We have been fortunate to find a retired farmer with his own equipment who sells it on the side. He is very conscience about cutting and he gives us a good price in the fall. He usually runs out of wood before mid winter. I’m glad you stuck to your principals and that you found someone who thinks along the same lines as you. 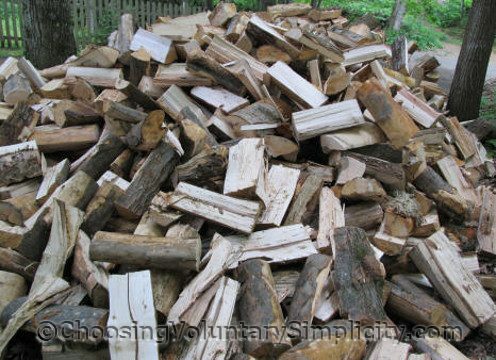 What a wonderful load of wood you have – sure to keep you warm.